Dies R Us: Wedding Day . . . It's Darlene ... here again to share my card creation using various dies from the Dies R Us Store that I hope will inspire you! Have you been following along through out the week? What amazing designs and ideas my team mates have all shared ! WOW! I too have drawn wonderful inspiration from this group! What fun it was to create this Wedding Scene! The walls of the 'church' were created by embossing the upper portion of a white panel using the Sizzix Tim Holtz brick wall embossing folder and sponged over top with Tim Holtz Tea Dye ink. The [ 'Party Music' ] music notes (there's always beautiful music at a wedding) were die cut from black card stock and popped up with pop dots. To create the 'stained glass' panel, I simply scribbled various pastel colors with my Spectrum Noir alcohol markers onto white vellum. Die cut my 'Grand Gothic Iron Work' using thin gold metallic card stock and glued the reverse side of the vellum to the back side of my gold die cut. After the glue dries, simply cut away the excess vellum with either your scissors or craft knife. For the fencing, I simply die cut my 'Victorian Picket Fence' with white card stock. BUT ... I did cut the lower portion off because it was a bit too high for the scene I was trying to create. And, I also cut a small section out of the center, as an opening so they could walk into the church! There are SO MANY things you could do with this fabulous 'Wedding Day' couple. and the bride in ivory card stock and paper pieced over the white panels. A little coloring was done for the hair, face, headpiece, dress accents with alcohol markers. Tip: You could add lace, tulle, pearls ... so many things for the brides dress. And you could make the grooms tuxedo any color you wanted. you could coordinate your card to match the bridal party! We thank you again for stopping by our new blog and hopefully you've been inspired! Catch you back here tomorrow when Sherri will have something new and fun to share!! Beautiful wedding card, Darlene! I especially love the stained glass you created. It really creates a feeling church & you can almost hear the organ playing the wedding march! Wow! How gorgeous! 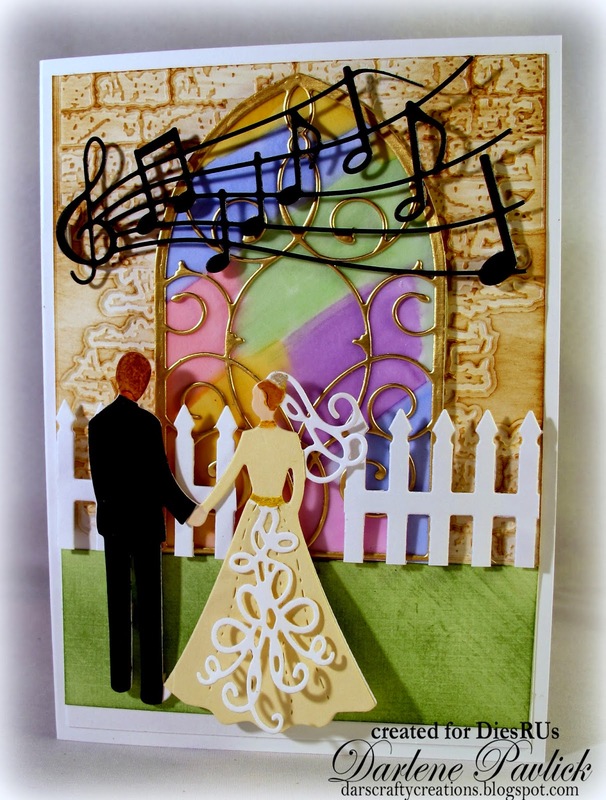 Love the romantic scene with stained glass, sweet couple holding hands, fence, and musical notes! It looks magical...love it! This is a beautiful card Darlene. It would make a gorgeous wedding card or invitation to the wedding with actual colors used or going to be used for the wedding. So many thoughts of what could be done with that dress...so, so beautiful. Thank you for sharing this easy to follow tutorial. THAT STAINED GLASS PIECE IS FAB.